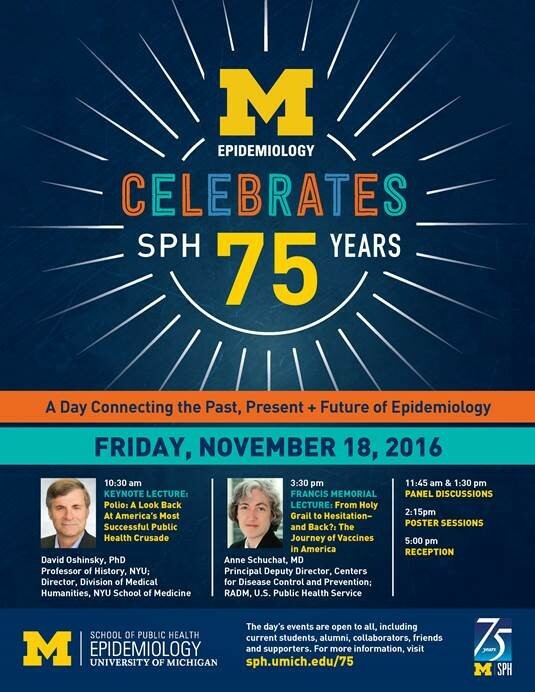 The Department of Epidemiology at the School of Public Health invites you to help celebrate the school’s 75th anniversary by connecting the past, present, and future of epidemiology on Friday, Nov. 18. There will also be panel discussions in the morning and afternoon followed by a poster session. Lunch will be included in the day’s activities along with a reception following the Francis Memorial Lecture. The event is open to all members of the UMHS community, though departmental alumni (student, staff and faculty), current members of the department and School of Public Health, collaborators and other friends and supporters of the department are especially encouraged to attend. For the complete agenda and additional details, please click here. Registration is free, though space is limited. Click here to register early to ensure your attendance at what promises to be an exciting, enjoyable and informative event!